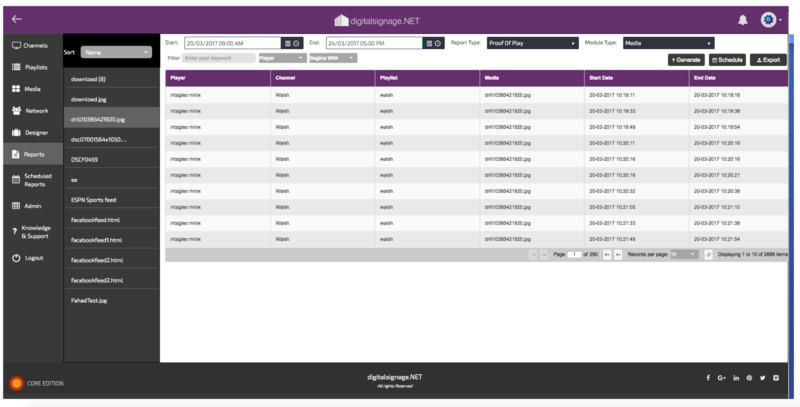 Proof Of Play– this type of report can be used to provide proof of play information on media assets (images videos etc) that are playing on your network of players. This is especially useful if you are selling advertising space to customers and they wish to see proof that their ad has played on screen.With Proof Of Play reporting, you can choose to run a report once or schedule a report to run weekly or monthly. This can also be emailed to specific user emails addresses if required. 1. Click on the reports button. 2. Select Proof of Play reports from the drop down menu. 4. Choose the Module type. 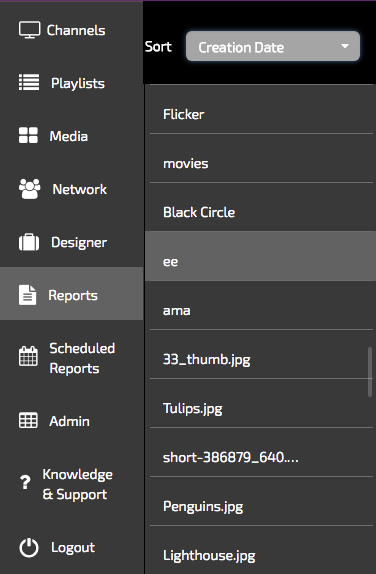 Media assets can be reported in module types of Playlists, Channels and Players. 6. Once you have selected the module type you will need to make a selection from the section on the right hand side. This section will contain media file names, Playlist names or Channel names, dependent on the module type that you selected. In this example I have chosen Media. 8. Your report will be produced. In the example below Media was selected from the module type and a single media file. 9. Reports can be exported to a .CSV file if required. To Export your report please click on the button.